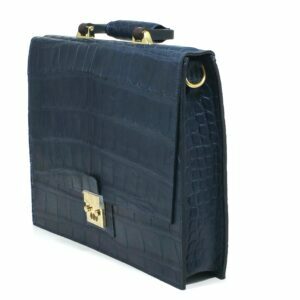 From our Exotic Collection, the Alexander Bespoke Briefcase, first briefcase in the exotic collection, has a genuine wild American Alligator exterior in Navy blue and Plonge cowhide leather interior in bone. 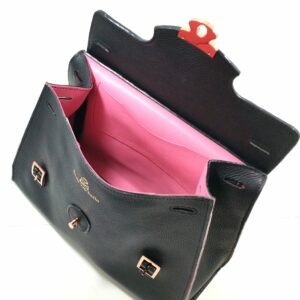 It is the perfect case for the discerning person in your life who desires a pop of color. Free Shipping In The USA! See details below. 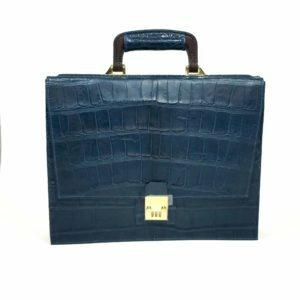 This Lena bespoke top handle handbag is the first sample of it's kind and the design will be archived and added to our Bespoke Collective due to the great admiration from our VIP clientele. Many color combinations are available. Free Shipping in the USA! See details below for more information. 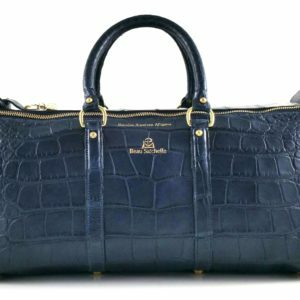 Another uniquely designed bespoke piece from our Exotic Collection with exquisite craftsmanship, we bring our first genuine wild American Alligator Duffle Bag in Navy blue with a soft yet very durable Marine blue Plonge cow leather interior. Free Shipping In The USA! See details below.